Although it has been 55 years since the last Spitfire rolled off the Supermarine Aviation production line the Spit is back. It's in production again, slightly smaller and made in Australia. After nine years in development, partners Mike O'Sullivan and John McCarron are producing an 80%-scale, kit version of the British fighter. The single-seater is called the Mk.25, the two-seater the Mk.26; both are manufactured by Supermarine Aircraft Ltd. west of Brisbane, on Australia's east coast. 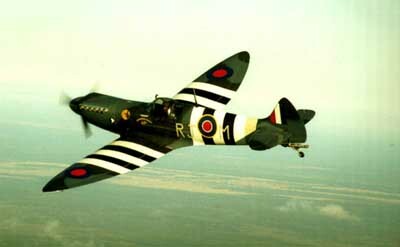 The design of the Mk.25/26 is based on the Spitfire Mk.V. The designations, however, pick up where Spitfire production left off in 1948 with the Griffon-powered Mk.24. Supermarine's kit Spitfire features electric landing gear and flaps, and is powered by an eight-cylinder, 200-hp Jabiru engine also made in Australia. It weighs 836 pounds empty and 1,433 lbs. fully loaded. While the real Spitfire Mk.IX two-seat trainer had two distinct bubble canopies, the new Mk.26 does not. It has a single bubble, with the passenger seat positioned where the radio rack would be on a real Spit. Another departure from the original is the shape of the cowl. The 200-hp Jabiru engine had six exhaust stacks per side but necessitated a flatter face on the cowling. With kit production at a rate of one every two weeks, Supermarine has sold 35+ kits in Australia, England, Canada and the U.S. To date, 10 are completed and flying, the company said. Like so many scale replicas before it, the Mk.26 was born of a dream. O'Sullivan, who grew up on a cattle station in outback Queensland, had always wanted a Spitfire but was put off by the $1.5-million price tag. So in 1991, he designed the Mk.25, determined to capture the look and shape of the legendary Spit, especially its signature elliptical wing. After flying the 75-hp, Rotax-powered prototype in 1994, he and McCarron teamed up to produce kits. Two more Rotax-powered prototypes followed, then one powered by a Jabiru engine. O'Sullivan worked his way up from the 80-hp Jabiru 2200 to a 100-hp version and the current 200-hp model. "The whole idea with the Mk.26," O'Sullivan said, "was to make it as Australian as possible and with the Jabiru engine, it's 100% true-blue Aussie." The constant-speed, four-blade propeller, however, comes from New Zealand. Construction of the all-metal kit, he added, complies with the "51% rule," otherwise known as FAA FAR Part 21. The Mk.26 requires more than 6,000 rivets and takes 700 manhours to build in the factory, plus another 1,200 hours for a first-time builder to complete at home. The section of the 27.7-foot wing outboard of the main gear is removable. The one-hour job makes it possible to trailer the Mk.26 home from the airport. The spunky Spitfire replica has a never-exceed speed of 190 knots, cruises at 160 and stalls at 42 with flaps, according to Supermarine's spec data. With a fuel capacity of 25 gallons and fuel burn of 9.25 gph at cruise, it has an endurance of three hours with reserves. According to Supermarine test pilot Richard Lea, the Mk.26 has a climb rate in the region of 2,500 fpm, "excellent handling and very pleasant stall characteristics." For more information, visit Supermarine's appropriately titled website: www.supermarineaircraft.com. Webmaster's note: I checked out the price! $96,000.00 (USD) NOT including engine, prop or guages. YIKES!Got a couple of bucks I can borrow?